Paul Bennett brought more than 15 years of experience in the design business to IDEO when he joined in 2001. Originally trained as a graphic designer in the UK, he ran his own brand design consultancy in New York for seven years, working in many different fields. He currently leads IDEO’s Consumer Experience Design Practice globally. Clients include Starbucks, Virgin, The Gap, Proctor & Gamble, HP and Pepsi. Paul relocated from IDEO San Francisco to IDEO London in October 2004. The interview with Paul was conducted on April 18, 2006. Paul, you are head of Consumer Experience for IDEO. Could you explain shortly what this is and includes? Put most simply, IDEOâ€™s Consumer Experience Design (CXD) practice is all about creating compelling emotional connections between people and companies, and then making those connections real in some way, through a product, a service, an interaction, etc. We overlap four areas of focus – Insight, Strategy, Expression and Communication, and use tools such as scenario building and protoyping, to apply this “think-to-build” concept to the design of experiences for our clients. What comes first for consumers, the brand or the product? And what comes first for IDEO? What management thinkers B. Joseph Pine II and James H. Gilmore first identified as The Experience Economy several years ago seems to have finally come to pass. The trend that was set by companies like Starbucks and Apple is becoming the norm in Customer Experience Management: Itâ€™s the experience that counts, not the product. Starbucks was one of your clients. What is it exactly that made the Starbucks-experience so successful over the years and how do you see the brand and product(s) of Starbucks evolve in the near future? Iâ€™m personally a big fan of Starbuckâ€™s â€“ what they provide is a bespoke experience to their customer. In fact I would go as far as to say that they provide a new form of â€œluxury”? experience; you walk into a coffee shop and they quickly and efficiently make you a cup of coffee that is exactly to your taste. They are very knowledgeable about their product, and provide it with a confident service. I spoke at a European luxury conference recently and everyone there was very mean about Starbucks saying that their brand of service was not â€œgenuine”? but give me that over rude so-called European luxury service any day! I am seeing Starbucks very carefully evolve their brand â€“ they are moving into the high-end liqueur business for example, which is very smart. If I were them, I would not stray too far from coffee. What can other companies learn from companies like Starbucks and Apple? Two things: one, have a very stong conviction about who your consumer really is, and spend as much time as possible out there in the real world engaging with them. I often say to my clients that their world is not the world of their consumer â€“ they live in cublicles and boardrooms and in focus group facilities observing their consumers â€œbehind bars”? so to speak, and that is not the way to be inspired or discover new ideas. When you see an Apple product for example, your first reaction is often â€œthese people really get me.”? Secondly, do not be frightened of design â€“ what both these companies share is an innate sense of using design as a tool for really communicating their values at every possible stage of the consumers â€œjourney”? through their brand â€“ the stores, the ads, the packaging, the product, are all designed with equal care and attention. You moved back from the USA to Europe. Do you see a significant difference in consumer experience practice between the two continents? In America, there is a general movement in business towards organizations flattening themselves out so that the best ideas can emerge from every level, be they the CEO or a junior manager. A lot of our process involves bringing together diverse project teams from both inside of IDEO and also our clients, and this ability to all sit down around a table and join hands so to speak in solving problems is critical. In Europe however, the concept of hierarchy is still alive and well, so this flattening is more difficult to facilitate; often people are scared to go out on a limb in case their superior thinks itâ€™s a bad idea and they lose face somehow. We have a highly collaborative process which involves lots of group interactions and that is more difficult to achieve in Europe. In the Telegraph you were quoted in an article about the service in British shops, which supposedly is amongst the worst in Europe. 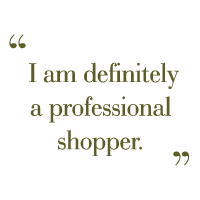 You said: “Like most shoppers, I just want to feel listened to, but I also want to feel in control. I want the shop assistants to be informed and be able to answer my questions. That’s all.” You didnâ€™t mention design and (interior) decoration as possible factors to positively influence shopping experience. Do you believe the success of the social contact with shop assistants overrules aesthetic factors in the experience? Absolutely. I have been in many expensive and so-called well designed stores all over the world where bad or ill-informed service completely burst my experience bubble, and conversely, some of my best and most authentic service experiences have occurred in holes-in-the-wall. Good design cannot replace or divert from bad service â€“ in many ways, it sets up a precedent that is hard to achieve â€“ the â€œthis looks good, it must be good”? factor if you like. Give me someone who knows and cares about what they are doing any day. Of course, there are some great examples where they have all the elements right and that is wonderful. Our capacity to feel and to share our feelings with others brings colour and texture to our lives. Emotion is an important topic to anyone who seeks to understand human behaviour. Our emotional reactions to events determine many of our actions. Of course, we can assume that consumer experience practice is all about human behaviour. Are human behaviour and emotional reactions important focal points in your work? And if so, how is this brought into practice? A colleague of mine Jane Fulton-Suri,who heads up IDEOâ€™s Human Factors activities, has pioneered methods to sense and respond to peopleâ€™s subjective emotional experiences. Observation reveals what is happening, but it takes interpretation and speculation to understand why. This takes a step beyond the purely objective to a subjective level where you draw on empathy. It is tempting to ask people to describe their emotional connections to places and things, but since much of this occurs at an unconscious level, it can sometimes be more informative to look directly at behaviour. We find again and again that actions really do speak louder than words. Companies donâ€™t innovate â€“ people do! Companies arenâ€™t diverse â€“ people are! Companies arenâ€™t creative â€“ people are! You have made these statements at various occasions, referring to the fact that we are all innovators, diverse and creative, as individuals, not the company as a whole. When we think of innovation, diversity and creativity in this sense, emotions will most likely have a great effect on the way they can be implemented. In your statements the focus seems to be on people inside companies. They are the ones that are innovative, diverse and creative. But, how can the internal people use their talents to become more people-focused in their designs, services, etc. for customers (outside)? It always seems so easy to hide behind the big company profile, which unfortunately often leads to flat, superficial and non-gratifying nor appealing products, services or designs. What should change? At IDEO we believe that Design Thinking should not be the unique property of designers but a set of capabilities and attitudes that the whole organization can leverage. On the other hand there is still plenty of ‘design’ that should be the responsibility of professional design teams. These teams may be more collaborative and inter-disciplinary than previously but a considerable amount of product and experience innovation requires the skills of designers to make them tangible. At the Technology, Entertainment and Design Conference in Oxford last year, you asked yourself during the closing session: â€œHow do we put ourselves in other peoples shoes and feel what they feel? ?“ This indeed seems to be the biggest challenge in emotional design. Did you manage to find an answer to this? We always start every project, whether itâ€™s the design of an object, a service, an interaction or a space with the same inspiration â€“ the user. We take this very seriously and we try wherever possible to take our clients along on the ride with us, to observations, to meet their consumers, their customers or their stakeholders. Often the reaction is â€œWow, I never knew people thought that about what we do.” People have quite violent reactions to the truth, and we use that as a way of starting tough conversations about how these organizations need to change or react to a particular problem. Weâ€™re starting to see this approach being mirrored in more and more organizations and the whole notion of what we would describe as â€œhuman-Centred design” is really starting to take effect in business at many levels. Being aware of real peopleâ€™s real needs is almost becoming a movement. At the same conference, you explained that the challenge for design is to reconcile what the “big” (nation, company) wants with what the “small” (individual) wants. When you look at this from an â€œemotion“ point of view, do you think the â€œbig“ ones could really be able to grasp what all the â€œsmall“ ones feel, expect and want? Design is moving away from being rarified objects that we worship on pedestals to a larger problem-solving process that we would describe as design thinking. Anyone can and should participate in this, and what is nice is that consumers out there are really embracing their own creativity â€“ theyâ€™re blogging, publishing, remixing and generally getting more actively involved in all aspects of what used to be the domain of a few rarified individuals. Smart organizations that both facilitate this dialog and harness its power will be both furthering their own objectives as well as those of their consumers. To conclude I have a few short questions. It changes every week. Right now Iâ€™m really enjoying communication experiences that are more emergent and ground-up â€“ the recent short films for Adidas on Adicolor are interesting. Conversely, Iâ€™m also loving the fact that Nascar, the All-American car racing association, is producing Nascar branded meat, potatoes and chain saws â€“ products for the real American male! Which books do you think are a must read at the moment? I have to be honest, Iâ€™m not a big fan of so-called â€œbusiness” books as most of them rehash the same ideas over and over again with more annoying buzzwords and jargon. I prefer to read blogs and just meander around the web. A colleague of mine, Diego Rodriguez, has a cool blog which I enjoy; Metacool. Where do you shop? And why there? I am definitely a professional shopper â€“ I justify it as my own personal form of Research and Development! I can go up or down the spectrum from the big stack-em-high chains and discount clubs like Samâ€™s or Costco all the way to small, weird local shops in small towns. What connects them all to me is that they have to be stimulating in some way â€“ scale, senses, excitement, fun. I canâ€™t stand bland – shopping malls where you could be in Florida or Newcastle leave me numb. And I hate airport shopping. My all time favourite shop is Dean & Deluca, a food store in New York â€“ basically itâ€™s a 5,000 square foot upscale deli, but you are bombarded with sounds, sights and smells. Great packaging, informed staff, weird vegetables, unusual products from around the world, all on low-key wire bakery shelves. Amazing. Thanks for your time Paul!